New moms and dads are notoriously tired. They’re up all night feeding, changing, rocking and loving on their precious little babies. Mother Nature’s sense of humor decided that – just as the sleepless nights start to fade, it’s time to force sharp teeth through your children’s gums in the middle of the night, a traumatic experience we’re all grateful they cannot remember. Chew beads, freezer rings, frozen washcloths … there are a plethora of options in the baby aisle to give your child when they’re teething. As long as it’s semi-soft and chilled, these tools can relieve some of the pressure on the gums and give you a few moments of peace. 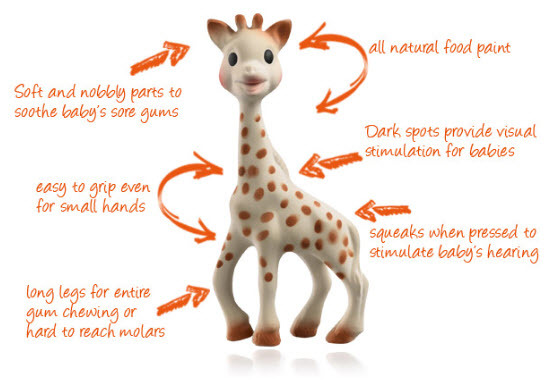 If you haven’t met Sophie the Giraffe or Kiki the Elephant, it’s time to buy stock in this awesome product! Most pediatricians and fellow parents may advise you to try Orajel and other products like it, but there are several things you have to remember when using them. First, don’t use them too often. If your child should swallow the gel, it can numb the back of their throat and affect the way they breathe. Some pediatricians recommend using Children’s Benadryl by applying a small amount to your clean finger or a pacifier, and then rubbing your child’s gums. More warnings of course, Children’s Benadryl is not intended to be ingested by infants, so make sure not to use a single drop more than you need on those gums. These look like pacifiers with mesh on them, and are intended to let your child self-soothe by gnawing on frozen fruit or ice cubes. These handmade necklaces are approximately 12-13 inches long, and provide anti-inflammatory and therapeutic properties. They’re not expensive, and can be ordered online from Amazon. 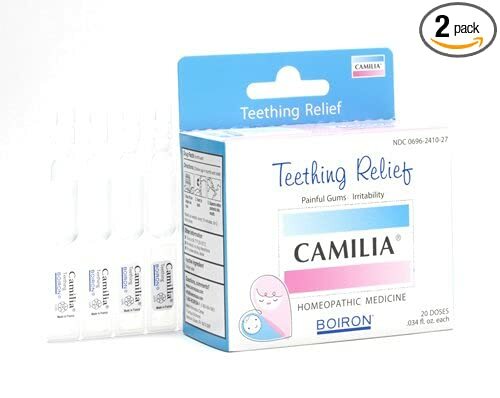 Homeopathic remedies can relieve gum soreness and pain brought on by teething, without giving your child medicine with preservatives. This product comes in single-use doses, which are sterile and very convenient. Teething usually ends by age 3, but not all children are the same. If your bundle of love doesn’t have as many or has much more teeth than their friends, that’s totally normal. No matter how many teeth they sprout in the first year, it’s a good idea to make your first visit to the dentist around their third birthday, though some pediatricians may recommend sooner. You should also start brushing their teeth with water before bed to get them in the habit of good oral hygiene. Have more questions about teething? Call your dentist or pediatrician for expert advice!